Did you know that there is a hole in the top of the Great Sphinx’s head? I’d heard of the rumours in the past but recently Jimmy on the Bright Insight YouTube channel brought to light a fantastic photograph you can see in the below video. It shows not just a hole, but a metal hatch that covers it. Not many people know this exists and there isn’t a great deal written about it and certainly the Egyptian authorities don’t like to draw attention to it. Many speculate that there is a chamber inside the Sphinx; radar surveys have certainly showed anomalies that allude to this, so could the hatch on the head be the entrance to an internal chamber? It’s an exciting thought but is it true? After posting the picture on Twitter a number of followers came back to tell me what they could find regarding this. So, it isn’t a first hand account, but it certainly proves it existed hundreds of years ago. An 18th century sketch also shows a huge ladder up to the top of the head and a man being helped out of the hole. These are thought to be French explorers. Another source says that in the 1920s, engineer Emile Baraize cemented the hole in the top of the head, possibly in an attempt to save it from crumbling. The excavation team stated it was five feet square and nearly 6 feet deep. He then fitted an iron trap door to the mouth of the hole. What we don’t know is if this cavity was fully excavated before cement was poured in, if it ran any deeper than 6 feet and what it’s purpose could have been. Maybe the cement was poured in to stop people entering The Sphinx, which is very possible as Baraize was working with the authorities during his excavation. Some theorise that the hole was simply to affix a large headdress to the Sphinx, but would a 5-foot by 6-foot sized peg be enough to support such a colossal chunk of stone? I don’t know, but the Dream Stele in front of the Sphinx, thought to be the work of Thutmosis IV certainly doesn’t show The Sphinx with any additional headdress. 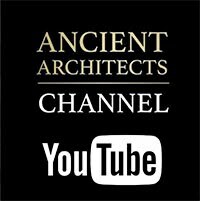 “Professor G. A. Reisner of Harvard University, who has been making a scientific examination of that mysterious Egyptian monument known as the Sphinx, has made several notable discoveries, which it is hoped will contribute materially towards the elucidation of a problem that has puzzled the ages. “Inside the Sphinx he found a temple dedicated to the sun. It is older than any of the pyramids and its date is somewhere about 6,000 BC, the most ancient in Egyptian history. Mena, or Menes as his name is sometimes spelled, was the first king of Egypt of whom modern scientists have discovered historic record. “The tomb of Mena, the king who made himself a god, and who fashioned the sphinx, is also within it. There are tunnels leading into caverns which have not yet been penetrated, for the work has only been going on for some six months. “The Sphinx is carved out of the natural rock, but within are the caves and buildings of a city of gold, which was perhaps once open to the air. “At present the excavations are confined to the chamber in the head. This chamber is 60ft long by 14ft wide. It is connected by tunnels with the temple of the sun, which rests within the paws of the Sphinx. “Such relics as the “Crux Ampata” symbol of the sun are found by the hundreds. Several of these are gold, and some have wires for tiny bells, which, when sounded by the priests, summoned up ghosts. 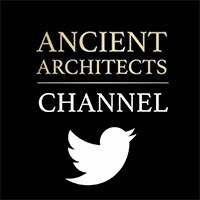 Are there hidden chambers inside the Sphinx? This is quite astounding. 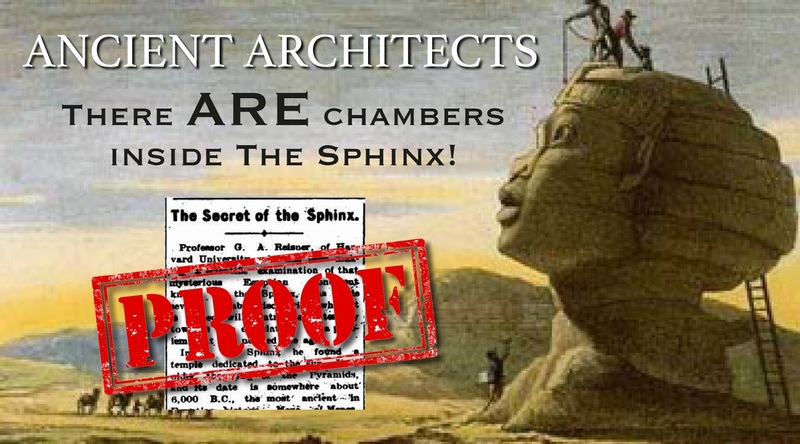 It is a first hand account of chambers inside the sphinx, reported in a reputable newspaper. The first dynasty ruler, Menes, obviously didn’t rule in 6,000 BC but his burial inside the Sphinx would certainly make sense if the monument pre-dated his reign. 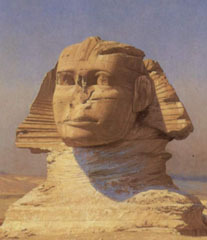 It is therefore likely that he is the one who re-carved the head of the Sphinx into his likeness. Can you see any similarities? It is of course open to debate. To disregard this information is to discredit a Harvard University Professor of Archaeology. 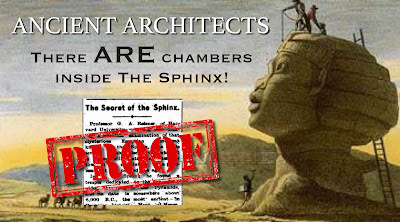 This is surely proof of chambers within the Sphinx and proof that the hole in the head is in fact the entrance to the most ancient temple in Egypt. Many believe that the Egyptian Hall of Records is either within or underneath the Sphinx and if there are in fact golden artefacts, concreting the hole and then sealing it with a trap door makes total sense if you want to stop people going inside. It does seem an odd thing to do, to go to so much effort to seal up the hole, if it simply nothing but a 6 foot deep hole. Some people are convinced that something was placed into the hole, such as an ankh, so that more precise pyramid-sphinx alignments could be made with sunrise on March 21st, but again it is just conjecture. Some say it is just a natural fissure but I believe this is just disinformation to cover up the truth that is being hidden from humanity. We have a right to know about our history and we should all try to delve deeper to find the truth.